Democrat activists pushed a false narrative from a fake Twitter account that helped to make a short clip of an encounter between a Covington Catholic High School student and a Native American activist go viral over the weekend, according to an examination by Breitbart News. 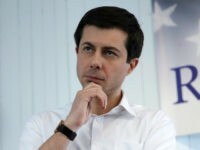 The episode has sparked questions among information warfare researchers, who say it has the hallmarks of a disinformation campaign. More questions were raised after Twitter suspended the account, @2020fight, on Monday for violating its fake account policy. Twitter also suggested the account was part of a disinformation operation. “Deliberate attempts to manipulate the public conversation on Twitter by using misleading account information is a violation of the Twitter Rules,” a Twitter spokesman told Breitbart News in an email statement on Wednesday. The spokesperson did not attribute the “deliberate attempts to manipulate” to anyone, but a source familiar with Twitter’s investigation said all evidence suggests the account was a U.S. account, not a foreign one. A spokeswoman for Sen. Mark Warner (D-VA) told the New York Times Wednesday that Twitter had found the account originated in the U.S.
Information warfare researchers also noted that the account’s English was natural and idiomatic. “Based on archive samples, its language use was idiomatic. None of the characteristic signs of Russian troll accounts here,” said the Atlantic Council’s Ben Nimmo. The account appeared to be briefly reinstated on Wednesday, and then subsequently deleted. The source familiar with Twitter’s investigation told Breitbart News the company did not delete the account. It is not clear yet who is behind @2020fight, and why so many Democrat activists had retweeted the fake account’s tweet. Last month, the New York Times revealed that Democrat operatives had used cyber fraud to manipulate the 2017 Alabama Senate race. According to Reid Hoffman, a billionaire who said his money inadvertently went to the operation, Democrat operatives created fake Twitter accounts with “Russian-sounding names” to follow Senate candidate Roy Moore in an attempt to discredit him. The operation, dubbed “Project Birmingham” sought to “enrage and energize Democrats” and “depress turnout,” according to an internal report obtained by the Times. The fake account involved in the Covington episode had several suspicious attributes. It used the name “Talia” and a stolen photo — one of a Brazilian blogger named Natalia Cardoso. Its bio said, “Teacher & Advocate. Fighting for 2020.” Its location said California. It had an unusually high amount of followers in a short period of time. It was created in December 2016, but by February 2, 2017, already had more than 6,300 followers, according to an archived snapshot of the account. It had more than 41,000 followers before it was deleted. It also tweeted an unusually high amount of times per day, according to some experts. It also was listed as a “social media influencer” for the social media marketing firm Shoutcart, where users can pay certain “influencers” to tweet out particular content, according to an archived screenshot. @2020fight’s Shoutcart profile said: “I have a very high engagement account with a popular culture/politics profile. My audience is educated and in their 20s and 30s.” The account was created in February 2018. Breitbart News took an in-depth look at how it unfolded. On Friday, January 18, a 26-year-old woman from Guam named Kaya Taitano went to participate in the Indigenous Peoples March in Washington, DC. She witnessed and filmed a brief encounter between a group of high school students wearing MAGA hats and Native American activists in front of the Lincoln Memorial. Taitano, under the handle @Ka_ya11, uploaded a 59-second long video to her Instagram timeline on Friday 7:33 p.m. ET. 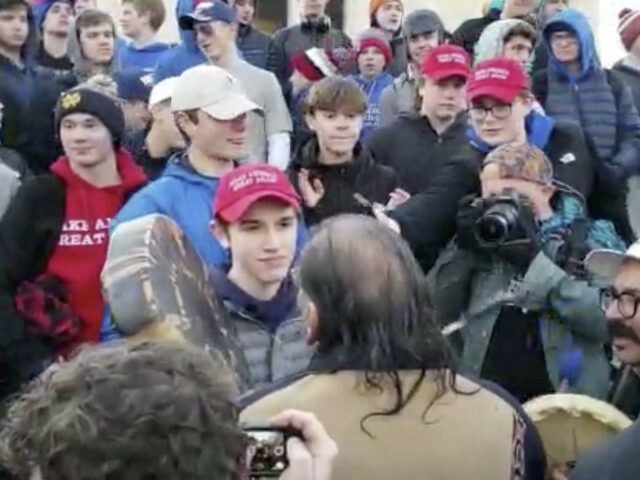 The video clip showed a student, Nicholas Sandmann, staring and smiling at a Native American man, Nathan Phillips, beating a drum and singing. 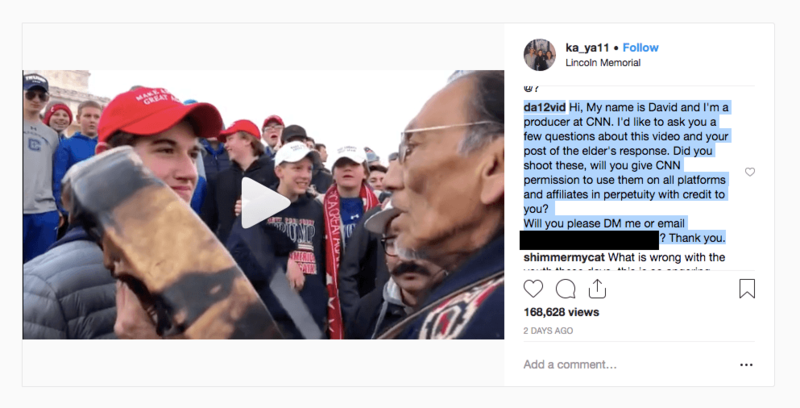 Taitano also uploaded a longer, 3:44-minute video of the encounter to her YouTube channel, along with the caption: “Is this how we make America great ‘again’?” She posted in the comments section to her first Instagram post a link directing people to her YouTube channel. Commenters on Instagram began to try to make it go viral, tagging major news outlets and personalities such as Black Lives Matters activist Shaun King. Some Native American activists began sharing Taitano’s Instagram video on Twitter, but their tweets did not get much notice. 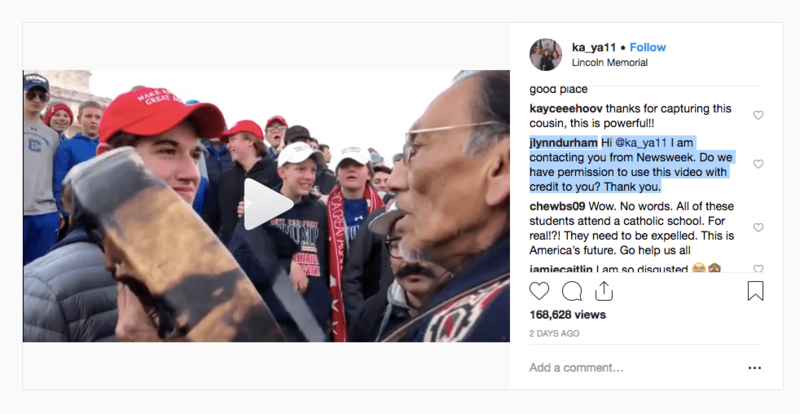 Sometime on Friday, a YouTube user named “Cowicide” uploaded the video to YouTube, along with a link to the Reddit post and a link to an image asserting to show proof that a student, Nicholas Sandmann, had approached the Native American man, Nathan Phillips. A Twitter user with the handle @Cowicide also tweeted out that same image several times and tweeted about the video numerous times. 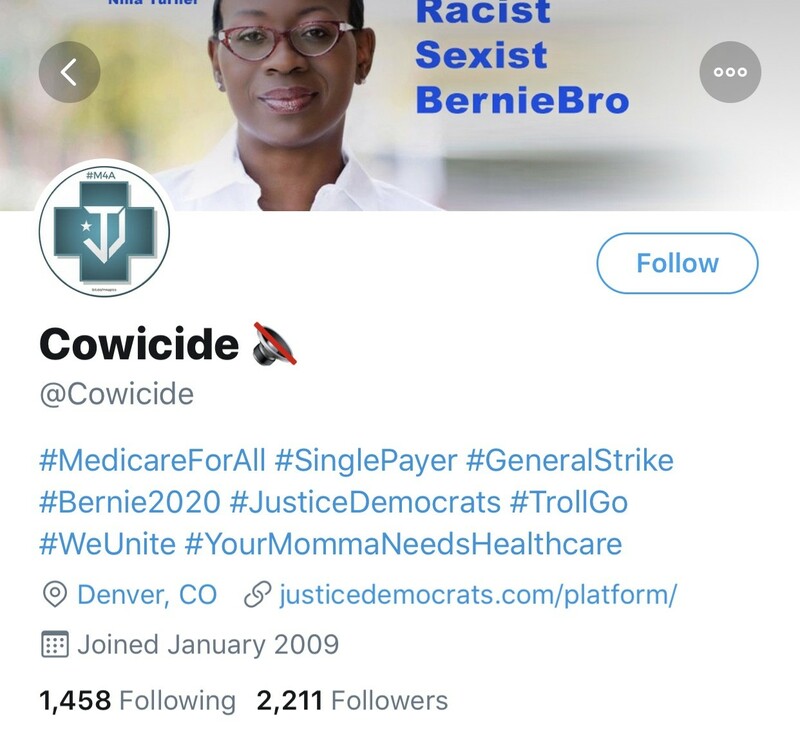 @Cowicide’s bio had a link to Justice Democrats, the democratic-socialist group that organized behind Rep. Alexandria Ocasio-Cortez. At 11:13 p.m. 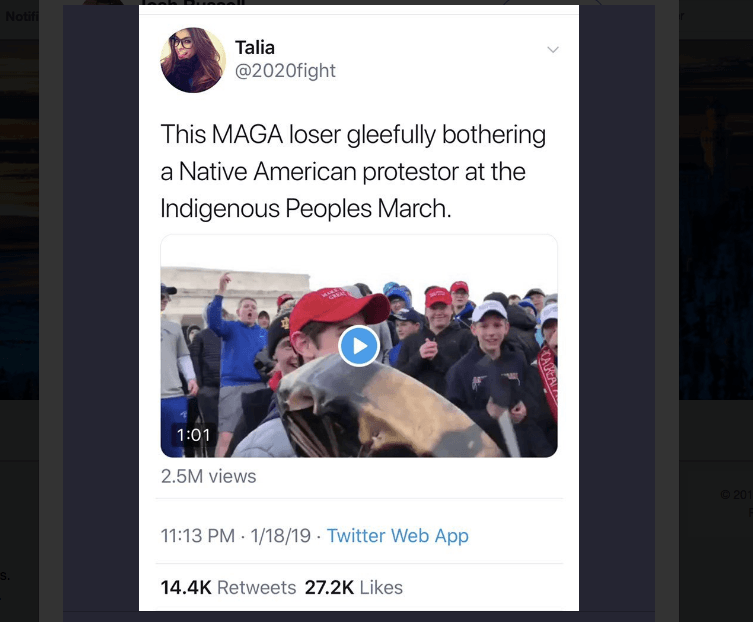 ET, the Twitter account @2020fight tweeted a 1:01 clip of the video, along with, “This MAGA loser gleefully bothering a Native American protester at the Indigenous Peoples March,” to its more than 41,000 followers. The video got more than 10 million views, and the tweet would get more than 28,200 retweets and 56,200 likes. Early Saturday, @2020fight’s tweet began to spread among activists. At 1:26 a.m. ET, the Twitter account for a pro-activist clothing company, @UncededClothing, shared Taitano’s video on Saturday. “MAGA wearing white boy mocking uncle Nate as he plays his handrum…this sh-t got me so heated.” The account user said he or she had to “rip the video off” Facebook, and that they “woke up randomly to the video going viral.” The tweet got more than 4,000 retweets and 12,000 likes. At 3:52 a.m. ET, Hend Amry, a Libyan-American activist who lives in Qatar with a large Twitter following, tweeted @2020fight’s video. Amry wrote, “not sure i have the bandwidth to process this today. i will return to this at a later time.” It got more than 330 retweets and more than 2,200 likes. At 4:16 a.m. ET, another Twitter user named “Lulu Says” with the handle @Lulu_Says2, tweeted in response to @2020fight with another video Taitano had posted on Instagram — a longer 1:01 minute video that showed a different angle of the confrontation. “It’s even worse when you see the full mob effect,” @Lulu_Says2 tweeted to its more than 6,600 followers. The Twitter bio for @lulu_says2 has descriptors such as “word writer,” “music muse,” “good vibe provider,” “kindness spreader,” and “reformed model.” The account owner tweeted to others that he or she was a San Francisco native and a “former admissions director” who worked at three high schools. The account was created in July 2017. The photo appears to be a black and white stock photo. Activists continued to retweet @2020fight’s tweet throughout the morning. At 5:32 a.m. ET, the Twitter account @IndivisibleNet tweeted @2020fight’s video. It would get more than 6,100 retweets and 8,800 likes. At 6:39 a.m. ET, an anonymous activist behind the Twitter account “Country Over Party” tweeted the YouTube video uploaded by “Cowicide” on Friday, calling for the video to go viral. “Make this go viral and ID every one of these racist punks. Many with young MAGA hats mocking an elder Native American protester at Indigenous Peoples March,” it tweeted. By Saturday morning, prominent experts and journalists began tweeting @2020fight’s video. At 8:41 a.m. ET, Molly McKew, an information warfare researcher, tweeted @2020fight’s video, along with, “Look at this generation of boys being taught that hate and disrespect are funny and cool.” McKew would tell CNN Business that she later noticed that a lot of fake accounts were retweeting it. At 9:21 a.m. 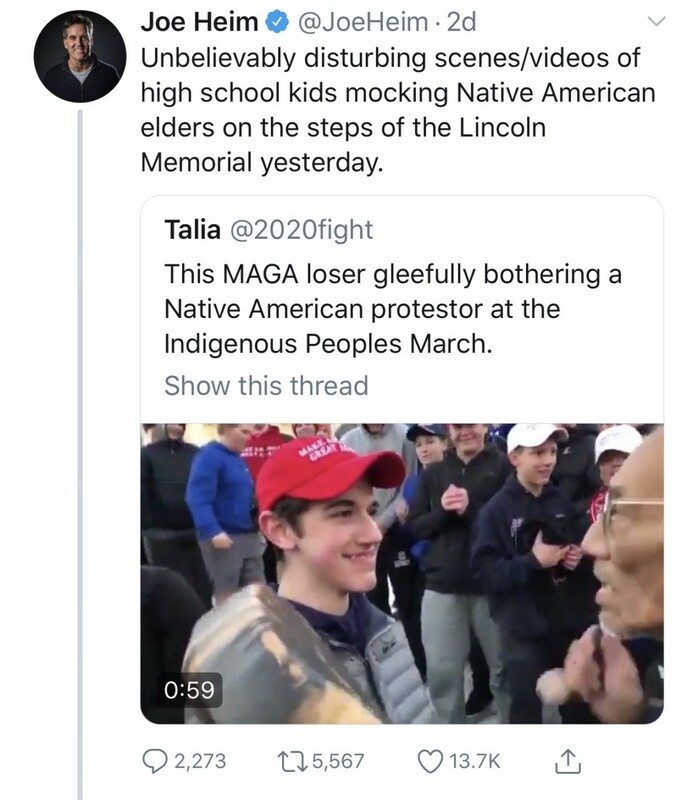 ET, Joe Heim, a Washington Post reporter, shared @2020fight’s video, with “Unbelievably disturbing scenes/videos of high school kids mocking Native American elders on the steps of the Lincoln Memorial yesterday.” His tweet got more than 5,500 retweets and 13,700 likes. Throughout the morning, influential Democrat activists with large Twitter followings significantly began to push @2020fight and @lulu_says2 ‘s video. At 10:03 a.m. ET, an activist named “Simar” with the Twitter handle @sahluwal shared @2020fight’s video. “A group of students from @CovCathColonels harassed & bothered this Native American protestor at the Indigenous Peoples March. Appalling,” he tweeted. It got more than 15,000 retweets and 32,100 likes. At 10:08 a.m. ET, he then shared @Lulu_Says2’s video. At 10:49 a.m. ET he also shared a screenshot of an anonymous person providing a narrative of what happened. Simar’s bio said he was an USC alum and “activist” and “child of immigrants.” He has more than 52,700 Twitter followers. Shortly after, at 10:31 a.m., a podcaster named Qasim Rashid shared @2020fight’s video. 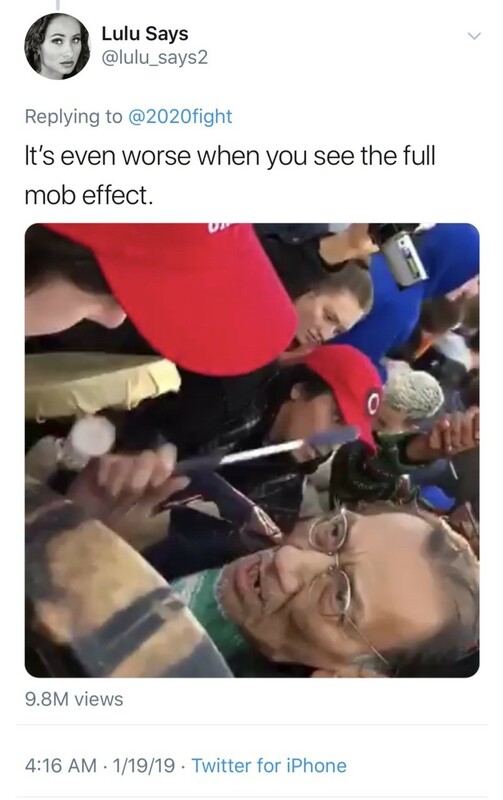 He tweeted: “Racist #MarchForLife participants harass & mock this elderly Native American man at Indigenous Peoples March.” It was retweeted more than 8,500 times and liked more than 21,700 times. His bio says he is the host of “ReSightIslam,” and that he lives in Washington, DC. He has more than 239,400 followers. At 11:02 a.m. ET, he shared @Lulu_Says2’s video. It got more than 6,500 retweets and more than 12,600 likes. It was retweeted more than 3,500 times, and liked more than 14,000 times. His Twitter bio says “Father. Activist. Runner. Educator.” He has more than 65,900 followers. Their tweets lent credibility to the videos from the anonymous-looking @2020fight and @lulu_says2 accounts, and their tweets, in turn, were retweeted by journalists, actors, and lawmakers with prominent Twitter followings. At 11:31 a.m. ET, Rep. Deb Haaland (D-NM) retweeted Simar’s tweet, along with, “The students’ display of blatant hate, disrespect, and intolerance is a signal of how common decency has decayed under this administration. Heartbreaking.” Her tweet got more than 13,800 retweets and 41,800 likes. At 11:37 a.m. ET, ABC’s “The View” host Sunny Hostin retweeted Singh’s tweet, along with, “Sickened and disgusted.” It got more than 1,180 retweets and 4,200 likes. At 12:06 p.m. ET, Soledad O’Brien retweeted Singh, asking, “Who’s the kid?” It got retweeted more than 2,000 times and liked more than 6,200 times. Other actors, including John Leguizamo and Billy Baldwin, also tweeted out @lulu_says2’s video. Democrat activists would continue to push @2020fight and @lulu_says2’s videos throughout Saturday afternoon. At 11:46 a.m. ET, Polly Sigh, a writer and activist, shared @2020fight’s video, which got more than 9,200 retweets and 12,500 likes. “The pack of reprehensible, racist boys in MAGA hats mocking an elder at Friday’s #IndigenousPeoplesMarch,” she tweeted. She also shared @Lulu_Says2’s video, which got retweeted more than 930 times and liked 2,300 times. At 12:08 p.m. ET, Waleed Shahid, communications director for Justice Democrats, retweeted @Lulu_Says2’s video. His tweet got more than 340 retweets and 1,700 likes. At 12:14 p.m. ET, an account named “Red T Raccoon” in North Carolina with the bio: “American, veteran, and advocate,” and more than 144,000 followers posted a longer 2:20 clip of Taitano’s video. “This is elder Nathan Phillips, an Omaha elder who is also a Vietnam Veteran and former director of the Native Youth Alliance … I stand with him.” His tweet got more than 13,300 retweets and 43,800 likes. At 12:57 p.m. ET, Khary Penebaker, DNC member, retweeted @2020fight. “Where was this white kid radicalized?” The tweet got more than more than 3,500 retweets and 14,400 likes. Penebaker tweeted the video again at 2:56 p.m. ET with, “It was never about boarder security, or economic anxiety. It’s always been about racism. Trump has made racism ‘great’ again.” It got more than 1,500 retweets and 4,900 likes. At 12:58 p.m. ET, Democrat activist Ryan Knight retweeted @Lulu_Says2’s video, getting more than 6,700 retweets and 19,000 likes. At 1:03 p.m. ET, the official Twitter account for Justice Democrats tweeted @lulu_says2’s video, along with, “So deeply disgusting and painful.” The tweeted got 4,600 retweets and 13,400 likes. At 1:23 p.m. ET, Rep. Rashida Tlaib (D-MI) retweeted Justice Democrats’ tweet, along with, “This is so hard to watch. It reminds us of the growing hate & oppression we are all up against.” The tweet was retweeted more than 3,600 times, and liked more than 14,000 times. At 1:47 p.m. ET, Kaivan Shroff, an activist and former Hillary Clinton campaign organizer, retweeted @2020fight’s video, along with, “MORE BRETT KAVANAUGHS.” His tweet got over 700 retweets and 900 likes. He continued to tweet about the encounter throughout the day and later retweeted his first tweet. He continued tweeting about the encounter on Sunday. Jane Fleming Kleeb, the chair of the Nebraska Democratic Party, retweeted @2020fight and @lulu_says2 and posted a photo of Nathan Phillips, the Native American. “I’m so disgusted. The man singing is Nate. He is an amazing dancer, advocate and father.” The photo got more than 2,700 retweets and 15,200 likes. Sometime Saturday morning, @2020fight’s video spread to mainstream news media outlets. Breitbart News reached out to McDonagh to ask what time he sent that message and how he came upon Taitano’s video. He did not respond. Williams did not respond to an email from Breitbart News asking what time he contacted Taitano, and how he first came across the video. Several other videos were being circulated, but not nearly as often as the ones from @2020fight and @lulu_says2, including from Instagram users @seedingsovereignty and @earthchores — which deleted its account after its video was seen at least 20,165 times. Although the Reddit post began circulating first, the first official media account of the encounter was written by Vincent Schilling for Indian Country Today. It was then covered by blogs and online news sites Crooks and Liars, WorldStarHipHop, BoingBoing, Wonkette, and Splinter News. The first local news outlet to cover it was Cincinnati Enquirer. It was then picked up by The Hill, WCPO, TMZ, WKYT, GQ, Daily Beast, Perez Hilton, USA Today, Huffington Post, the Courier-Journal, Mother Jones. By Saturday afternoon, it had made its way to the Associated Press, the Washington Post, and the New York Times. The stories largely followed the narrative painted by @2020fight and Democrat activists, that the high school kids had harassed Phillips. The story also made its way to international media and was covered by Haaretz and others. It became a full-blown national controversy as Democrats called for the boys to be expelled, the high school apologized for the boys’ behavior, and numerous voices on the left — and the right — were condemning the students. After a two-hour video of the encounter emerged on Monday and showed that the kids had been first harassed by a group called the Black Hebrew Israelites, and that Phillips had approached the boys, news outlets amended headlines that initially said the students had surrounded or harassed Phillips. Also on Monday, Twitter suspended @2020fight’s account. CNN Business reported that Twitter suspended @2020fight’s account shortly after CNN Business had asked Twitter about it. On Tuesday, CNN Business reported that Twitter’s “initial findings” suggested it was an account run from the U.S., although it could be difficult to determine what country an account is run from. On Wednesday, a source familiar with Twitter’s investigation confirmed to Breitbart News that all evidence suggested it was a U.S. account, not a foreign one. “This is the new landscape: where bad actors monitor us and appropriate content that fits their needs. They know how to get it where they need to go so it amplifies naturally. And at this point, we are all conditioned to react and engage or deny in specific ways. And we all did,” she said. While she and others first suggested that Russian bots were behind the operation, other disinformation experts noted that the tweets from @2020fight seemed to be from a native English speaker. “We found hundreds of cached tweets that show perfect mastery of idiomatic English, and even discussion of everyday issues ― something unusual in true Russian troll accounts,” wrote researchers Ethan Fecht and Jack Nassetta in the Huffington Post on Tuesday. In an odd twist, the @2020fight account appeared to be briefly reinstated Wednesday morning. It blocked this reporter from viewing its tweets. The account was then deleted. One information warfare expert speculated to Breitbart News that the account owner may have verified to Twitter that it was a real account, which allowed it to be reinstated, and then deleted the account altogether. The original Reddit post was also deleted by Monday evening. The YouTube user “Cowicide” later posted on YouTube a link to a new post on Reddit which contained an alleged confession from a user named “NewFound_Fury” that he or she had posted the first video of the encounter to Reddit, and was regretful after fuller video of the encounter emerged. “I posted the original MAGA hat-wearing kid standing up to a Native American video on r/trashy, and I want to apologize to him, those kids and their families. I was wrong,” it said. On Tuesday, @lulu_says2 briefly locked its account, before unlocking it again by Wednesday.